When Big A turned two, I realized that making two meals for dinner wasn’t working. But getting her to the table right as she was entering the picky stage was no easy task. What kept our family meals going in those early days was having something at the table she accepted. It helped her adapt and come to the table without much of a fuss. 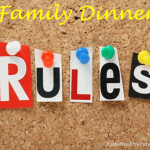 Last week I reviewed some helpful rules for family dinner, of which one was “There will always be something on the table you like.” In this post, I want to dig into that one a bit deeper. 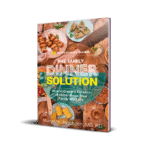 For me, it’s no longer just about providing a thing or two my kids like — I have an entire side strategy for my family dinners. 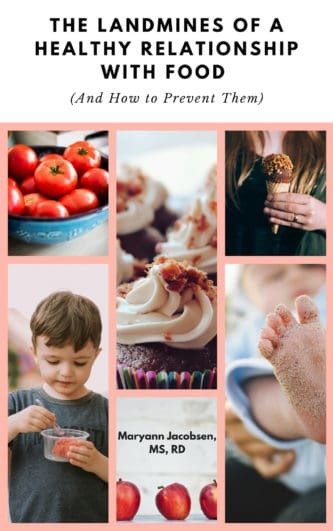 This side strategy is good for when kids are young and older and in between. Most importantly, it helps busy parents pull together family meals with ease. What is a side strategy? 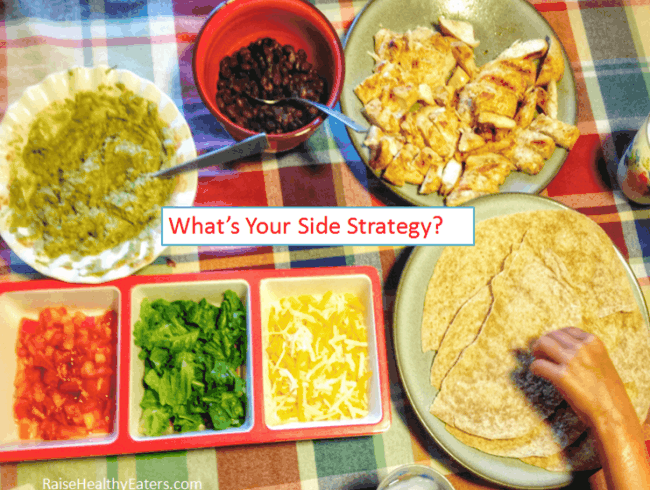 A side strategy is really just being thoughtful and strategic about the sides you serve alongside the main meal. Because I have a dinner rotation and theme nights, I have familiar sides I put out on the table. Take the Pollo Asado meal I served on Monday for Mexican night. 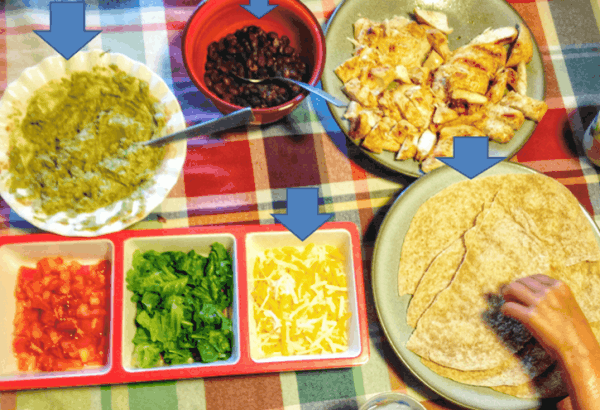 My sides always include tortillas, beans (pinto or black), cheese and guacamole. This helps me in two ways. First, if the kids aren’t ready to eat the Mexican meal I serve, they can always make their own burrito. Second, I don’t have to stress about sides, they are already planned out. My side strategy for Italian night is at least partly geared towards Little D, who doesn’t accept pasta in any form like his sister does. 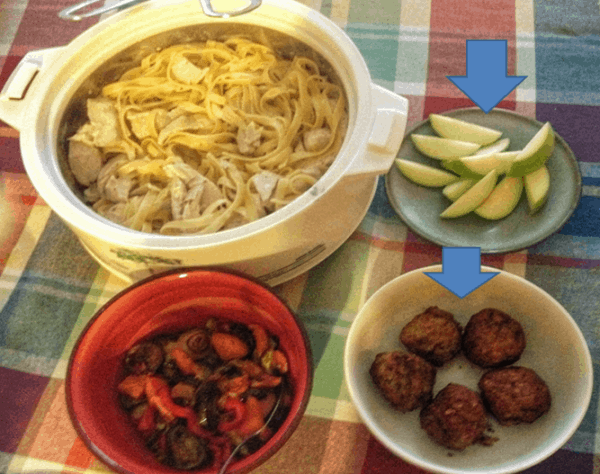 So if I’m cooking something I’m not sure he’ll go for, like the chicken Alfredo, I put out some turkey meatballs from Trader Joe’s along with fruit. For soups and stews, I serve garlic or cheesy bread. Square meals (protein, veggie, starch etc) contain a well-liked potato side (like baked fries or roasted potatoes) or fruit. With Greek food, I put out pitas and hummus. And Asian is rice and fruit. Then there are the meals that everyone loves like spaghetti. I can get creative with sides or just serve any side I want which in this case was roasted asparagus and my fave summer fruit: cantaloupe. And I usually try to have a salad on Italian night. We are almost to the point of not having to make sure there is a side my kids like. Big A, who is almost 9, accepts so many main meals now that it’s really not an issue. Little D will get there too, even though it will take a bit longer for him. 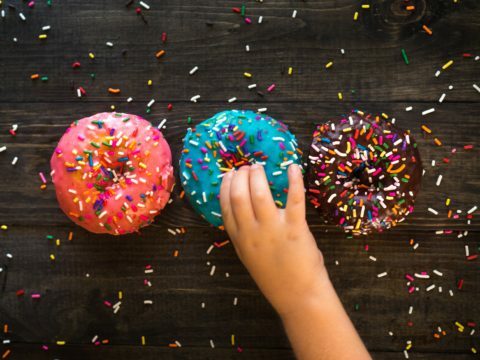 As kids get older, it’s more about making small modifications to sides to make them more nutritious (especially if you’ve been breaking the nutrition rules to gain acceptance). It’s also about trying new things as kids become more adventurous. And as children’s kitchen skills increase it might make sense for them to take over this side job. As I look back on the last 7 years of cooking family meals, I feel grateful for my side strategy. I credit it for keeping our meals pleasant and calming my worry about what my kids eat or don’t eat. It really has saved our family’s mealtime. Have you given much thought to a side strategy? 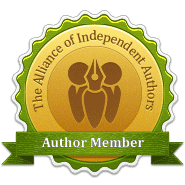 Want to see the final product with all the recipes and strategies? 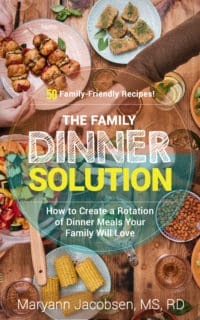 Check out Maryann’s book The Family Dinner Solution: How to Create a Rotation of Dinner Meals Your Family Will Love. I like this idea, but it sounds like a lot of work. Some of these examples seem to me pretty much like making a second dinner. 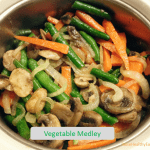 Sometimes I manage to incorporate a side my son likes, but I often find it difficult, especially if I’m making a one-dish meal. What I’ve been doing instead is Dina Rose’s strategy of offering a standing backup meal – in our case, plain tofu and cucumber. But I can see it would be better in many ways for everyone to be eating the same family meal. It actually isn’t that much work because I need to make sides anyway. I just consider my kids and try to have a side they like. If it’s too much trouble, you can always do what Ellyn Satter suggests and always have bread with the meal. My strategy has just kind of evolved over time. I’ve tried to get better about not putting out too much (I recently asked my huisband about getting a smaller kitchen table and he just laughed!). I’ve read Rose’s recommendation for a back up meal but with pickier kids that can get tricky. I know she recommends the item not be something they really like but I just like to have one enjoyable meal and include sides. But different strategies can work for different families. This strategy has really helped our family too! Thank you for the great idea. 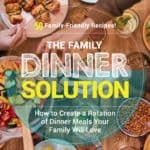 Our dinners are nearly stress free because of this and other suggestions of yours! Thanks Jenny! That makes my day! Sure I make sides with dinner. But I make one. Sometimes that is what’s devoured (like canteloupe, as you do occasionally), sometimes not (like a green salad). And I’m okay with it either way. 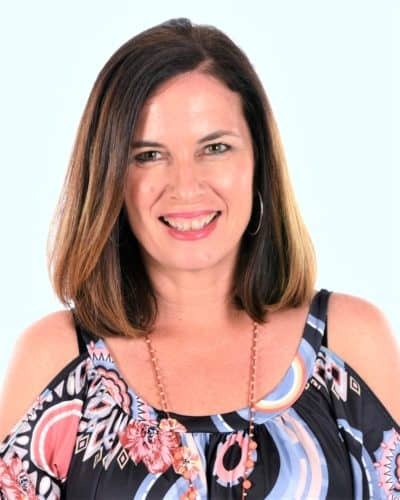 What’s taken the stress out of meal time for me? NOT STRESSING IF MY KIDS DON’T EAT. Most kids are so well fed in our country, they don’t know what it’s really like to be hungry. If they are hungry enough, they will eat what I put on their plates. 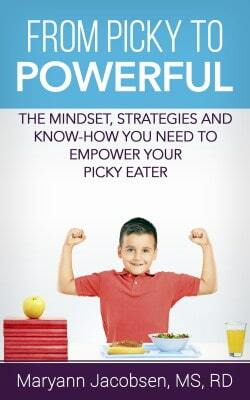 Picky-ness is sometimes related to foods my kids don’t like. But more often than not, it’s because I put something in front of them that they’ve never had before and “looks scary”. Making the same thing week after week is boring to me, as the cook in our family, so I like to make new things. We have the rule for our 3-year old boy that he doesn’t have to like it, but he does have to try it. For our 6-year old girl, she’s old enough that she doesn’t have to like it, but she does have to eat it. My 15-month old is the only one who I will make special consideration for. No special meals or extra stuff for the older two. Otherwise they would live on cheese and bread and peanut butter. Sometimes one or both will choose not to eat (even if our once-weekly dessert is hanging over their heads!) That’s their choice. I am so tired of worrying about what my kids will or will not eat when we go out to restaurants or to someone else’s house. Kids need to learn to eat what’s placed in front of them. It’s just food!!! My kids are not starving. So I chose to stop worrying, and it has been liberating. I didn’t say anything about serving separate meals just providing something at the table kids are likely to accept. If I had 12 kids I would cook differently and probably always have bread or something at the meal. Well, my parents had 8 kids, and of course they didn’t cook us all separate meals, but that doesn’t guarantee kids won’t be picky. 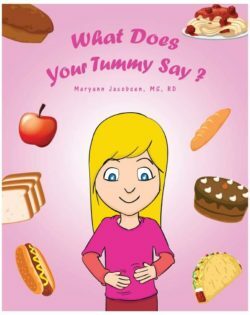 E.g., for several years when I was little I had an intense phobia about chewing and swallowing meat. I wasn’t faking it; I was genuinely terrified I would choke. I still remember sidling up to my mom every afternoon when I was about 5 years old and asking – all pretend casual – what was for dinner. If the answer was something soft like pancakes or meatballs or chowder I was happy; if it was steak or pork chops I spent the rest of the afternoon quietly dreading dinner. After months of making me sit at the table for hours to finish eating my meat, my parents eventually realized that, whether this issue was psychological are not, it was beyond my control. They stopped forcing me, and before too long, I got less stressed about eating and learned to eat some meat after all. Which is just to say, children having trouble eating is not some consequence of spoiled only children. There’s nothing wrong with giving your children an out from an intolerable situation; and there’s nothing heroic about forcing issues with them just to prove your authority. I love this, it’s very similar to the way I cook at home too. Most Indian meals always comprise of 2-3 sides, including salad/yogurt and some form of bread/rice. And since we eat this was 3-4 times a week, I know that my 4-yr will always be happy and well fed. It surely is a strategy that works! I love this idea! My five year old isn’t a fan of the same foods my husband and I like, and mealtime should be a pleasant experience. No one forces me to eat that which I dislike, and I’m not about to have a food struggle with him. He tries new foods when he feels comfortable, and that works for us. Having the sides will make that even easier. Your welcome. Let us know how it goes! This is just the answer that I am looking for! My daughter is so picky that when she doesn’t like what’s on the table, she’d rather not eat dinner. Sometimes I feel so frustrated about it. Thanks for your strategy! I get to encourage my daughter to eat what is being served. Thanks! Funny, this is a strategy I’ve been using without really thinking about it! 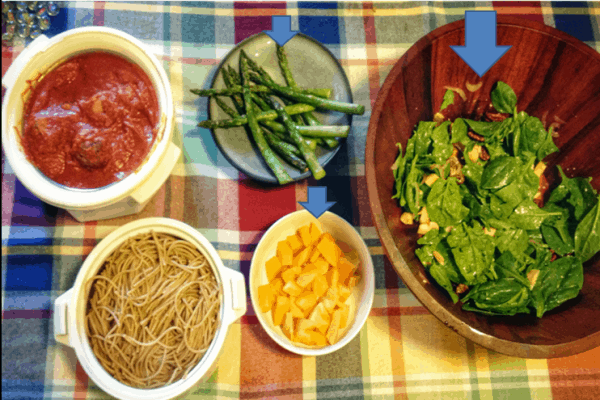 We almost always have mixed dishes – my husband and I love them, but we also throw some bread, cheese and sliced peppers or cucumbers on the table, too. When our daughter says she doesn’t like the meal, we just point her towards those other items. Fabulous!